We have a real treat today. 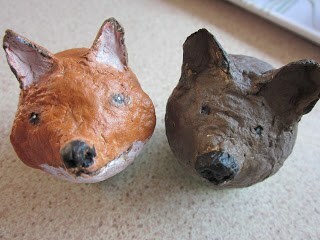 Rex Winn has been a good friend of this blog for a long time, and he’s shown us many of the piggy banks that he’s made. I’m very happy to say that he finally agreed to show us how he makes these delightful little sculptures. The bank in this tutorial is in the shape of a calf. By the way, I’ll happily take credit for sharing the idea of using patterns for animal sculptures, and for the paper mache clay recipe — but Rex is the one who came up with the idea of making a hollow sculpture with patterns and pm clay, and then using them for piggy banks. The pattern is all his, as well, and it’s very kind of him to share it with us. Now we can make one too, just in time for the holiday season. Thanks, Rex! The process of making this piggy bank came from Jonni Good’s book, “Make Animal Sculptures.” The chapter that I used the most is Chapter 6, Piglet. Except, of course, the part about cutting it in half! The first step was to transfer the pattern onto foamcore board (or cardboard). 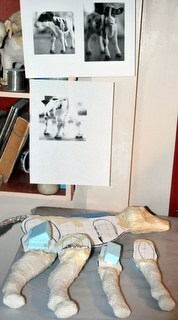 The photograph I used was a miniature toy calf and was printed on a grid created in WordPerfect. I decided the size of the bank and drew 3/4″ grids on the foamcore. (See illustration 1.) It is helpful to me to draw where the legs, eyes, and mouth are on the pattern. 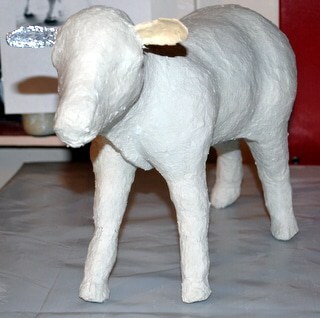 Next I pull everything that is inside out, except the foil attaching the ears and tail. The first time I did this, the process took me 4 hours. This time I used a heavy flat-nosed pair of pliers, and it took about 40 minutes. The mess looked like this (illustration 6). I think it also helped to use bubble wrap because it came out in clumps, although my dogs hates it. I make piggy banks for bills only, so the hole is small. The hole is on top of the neck in the black spot. I painted the hole black so it is difficult to see. I make the hold using a Dremel tool – using a bit that looks like a drill but will cut sideways. The final product, illustration 13. If you have any questions, I would be happy to answer them. One final comment: I love this process so much more than the balloon version. Balloons tend to expand or shrink depending on the temperature. 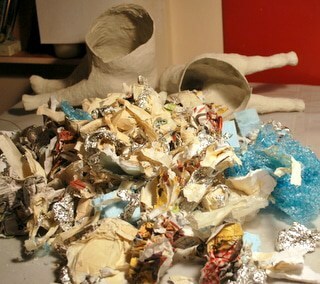 I can’t say how many I have thrown out because the paper mache had collapsed. Besides making a more pleasing sculpture, the control using this method is great. Thanks to everyone for their inspiration. Hello, I stumbled upon this page about an hour ago and I am still here browsing. Can I share with you a couple of my ‘egg heads’. I have a huge stash of hens eggs that i have blown and now and then when I return to ‘playing with my paper pulp and eggs’ I make ‘stuff’…. all kinds of ‘stuff. This is Foxy and his friend Bear. Both made on a blown egg base. The paper I make from old envelopes that i whixx up in my blender with a bit of hot water… I rarely use glue as the paper tightens on the shell like a skin when it dries. Hi Jonni. 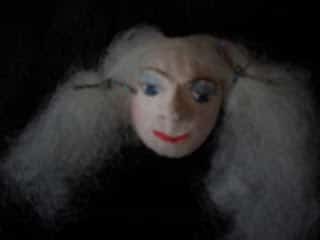 I have emailed you the intsructions for how I make basic egg heads. The animals are made in exactly the same way. Thanks, Cherie! That’s so nice of you. I’ll post it tomorrow morning. Two of my friends from school recommended using this site because we are doing a hall project on Australia. 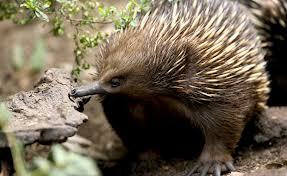 I have to do an echidna, (sort of like a porcupine/anteater.) How would you recommend me making it? Out of wire or a cardboard structure with paper and paper mache and/or paper mache clap on top? My project is due on January 22, 2015 so I have some time to turn it in but I have to start pretty soon since it takes a while to make. Thank you in advance for reading my comment! I appreciate it! P.S. Gloria and Destiny are the friends I’m referring to. 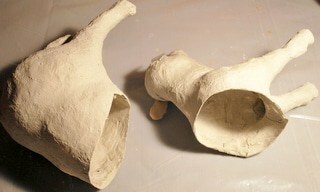 Sorry I meant paper mache clay not clap. Hi Serra. It just happens that I wrote a tutorial for making an echidna several years ago. 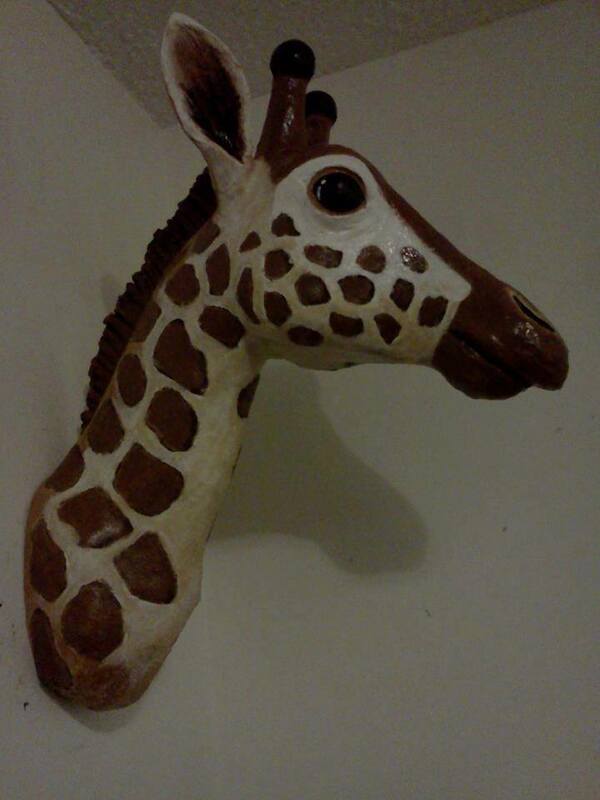 I made him before I developed the paper mache clay recipe, so it was made with paper strips and masking tape, and I smoothed it with joint compound. If I did it again, I’d use the clay recipe. By the way, the wooden toothpicks that I used stab me every time I pick up my echidna. You might want to find something softer if a lot of people will be handling it. And say ‘hi’ to Gloria and Destiny for me. By the way, is this a biology class, or an art class that you’re making all these animals for? I do hope we’ll get to see them when they’re done. Oh, every three years at our school we do a hall project. We pick a continent(Australia this year),paint the hall, and everyone makes animals from grade 6-8. That sounds like a great project! I hope you have fun making your critters. I can’t wait to see how they come out. First off I would like to say that your tutorials are so helpful, you put your heart into everything you make and they always turn out beautiful. Second: My friend and I are doing a school project on Austrailia, and it involves us making an emu and a quokka. Our teacher would like us to use wire, but she showed us a video on the elephant you had made. She told us that we didn’t have to use wire. Do you have any tips, advice, or pointers to share with us, about how we should do this? Hi Gloria and Destiny. Thanks for your kind comments. I admit I’d never heard of a quokka, so I had to go look it up. What an adorable animal! For the quokka I would recommend the cardboard pattern technique, especially if you can find some photos that have been taken from the side. That way the hard part of getting the proportions right is already done. For the emu, though, it would depend on whether or not it’s standing on two legs or nesting, with legs folded up underneath. 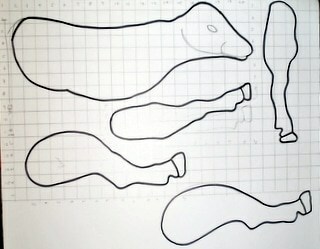 It would also depend on how big you intend to make your sculptures. A standing lifesized emu would need at least one piece of rebar (concrete reinforcing bar) for each leg. A smaller version could use smaller wire. The long neck would probably need to be shaped like a snake, with fairly heavy wire along both the top and bottom edges. You could fill in the neck itself with crumpled paper and masking tape, and the wire will hold the head in the position you need. The emu is going to be a big challenge for another reason – getting it to balance correctly while standing is not going to be easy. Every minor change you make in the position of the head and neck will change the balance. You can help the process along by using small pebbles or other weights taped to the tail end, which will tend to be lighter. Otherwise the bird will try to fall on it’s nose. 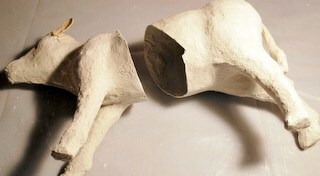 How soon do you need these sculptures to be finished? When they are, I do hope you’ll take a photo and upload it to a comment, so we can all see how they came out. Thank you so much! Our project is due January 22,2015, so we have plenty of time to finish our sculptures. I will upload a picture of our animals once we have finished. I love, love, love the calf money bank. Do you have to kill the calf to get the money out? I sure hope not! I love him! You’ve got me wanting to make banks for my grand children. I actually like the idea of not having the front foot not touching the ground. Gives it more a feeling of motion. You did a great job! Thanks, Julie. Yes, people protest about not getting the money out, but that is my point. The best suggestion I have seen came from Jackie (I believe!) who suggested something like a plastic bottle cap that one can screw off. I haven’t tried it yet but might one of these days. 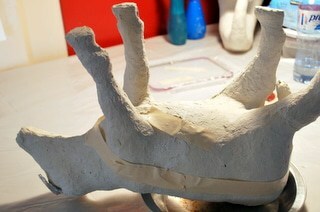 I think enough of the plastic could be worked into the bottom of the paper mache so it is stable. Just an idea. I like the front foot off the ground – until it falls on its head! I had done a number of chickens with only two feet, but balance is a challenge. 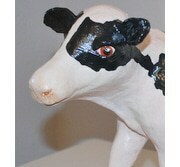 But I’m not sure why the cow got his burn sienna wash (figure 11). I mean it does not show in the pictures so I’m assuming there is a warmer quality to the white? The Burnt Sienna wash makes a big difference because it takes away the stark white color, especially if you see the bank. 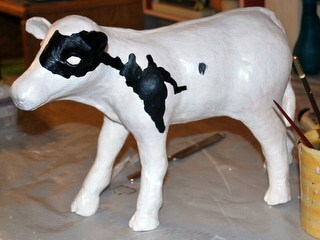 I add glazing liquid and water to the white paint on the calf, so the warm skin tone does show. I will attach a close-up photo here, which I think shows more clearly the “white” color. 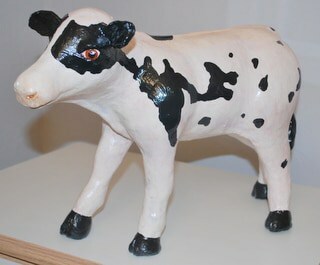 I’d like to leave a comment for Rex for his cow. It is so very very cute. I love it. 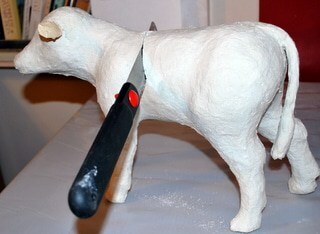 I would however like to make a suggestion as I am making a reindeer for Christmas. 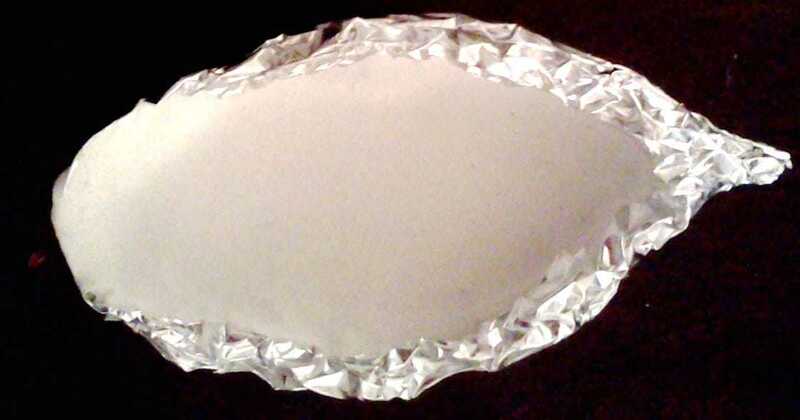 To keep them from crumbling, I would like to suggest placing a bit of wet plaster of paris inside the ears (just enough to cover the circumference of the ear) and allow them to dry and paper mache over them. I will gladly show my reindeer when I get it finished. This worked for my Reindeer since I too, made the ears from foil. Lisa, that sounds like a great idea. Over the years, my biggest problem has been ears. I’ll have to put plaster of paris on my list. Thanks. Rex, This is the results how my reindeer ears came out. I wanted to use this as an example. Hope this helps. Lisa. Lisa, that is a very pretty ear. A photo is worth a thousand words. This is helpful to me. Thanks. Thank you and your very welcome. 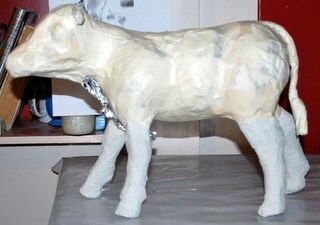 I will gladly show the rest of the reindeer when I get him finished. I’m glad I was able to help. If the plaster itself isn’t quite enough, I like to make a mixture of 1/8 cup cornstarch,about anywhere to 1 to 1 1/2 Tablespoons of water,and 1 Tablespoon of white school glue enough to make a thick paste. I then took a little brush and painted this over the dried plaster inside the ears.. This is wonderful for creating an extra hardener for the weaker part of the project. 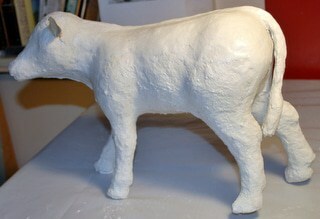 I’ve been paper mache’ing for a little over 20 years and I have done many experiments. I envied your little cow and read where you were having troubles with the ears. I wanted to give you this tip with my experience. Hope this helps. my pictures are not uploading. Your welcome to follow me on Twitter under @macheartist if you are on Twitter. All my projects are on my page. Lisa, thanks so much. This is a great idea – thinking outside the box. I’m going to try it. It can’t be worse than the surgery I put them through. 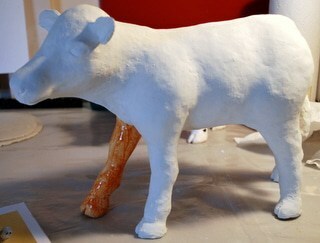 So far I haven’t had problem with legs holding up a body, but I might when I begin making larger animals. Thanks again. Your so welcome. It seems complicated at first, then it all starts to make sense when problems starts to occur. Again, it was just a suggestion to help along. I can’t wait for my reindeer project to complete. I will be more than happy to show it to you. It is almost done. Great tutorial. May have to try an animal myself. I tried a balloon as well and it broke before it was dry. I was able to fill the cavity with a bowl and got it partially saved. but no more balloons for me. Even though they do create a nice shape. Wow Rex! You did a great job. Oh and when you cut the calf into, I bet that was really hard to do….i mean make yourself just destroy what you just made. But you put the parts back together very nicely. Yep, i’m impressed. So you answered my question about using a balloon for the cavity of the body. Really good!!! Thanks so much for sharing!!! Rex, your calf is absolutely lovely. How tedious to be pulling all the stuffing out like that. It looks like even the legs are hollow. I hope whoever receives this does not plan to open him up any time soon! Nice work, thanks for sharing the process with us. Gussie used this poem for a piggy bank she made, and I stole it, with her permission, and give it out with the banks. Yes, the legs and head are hollow. Thanks everyone. Appreciate the comments. Fill me up, including my chin. A set of wheels for a spin. Break me open, down payment is within!